March 18, 2015, 4:28 p.m. In 2015 for the first time YouGov research showed that most Americans think that race relations in the United States are &apos;bad&apos;. 2014 was a particularly controversial year after the controversial killings of Michael Brown and Eric Garner which prompted large protests across the country. While the overt racism and segregation of the 60s and before is now largely consigned to memory, the slow pace of integration and continued economic disadvantage ensures that most black Americans and white Americans live very different lives. With these controversies dominating headlines Americans are talking about race and racial issues more than at any other time in recent years. 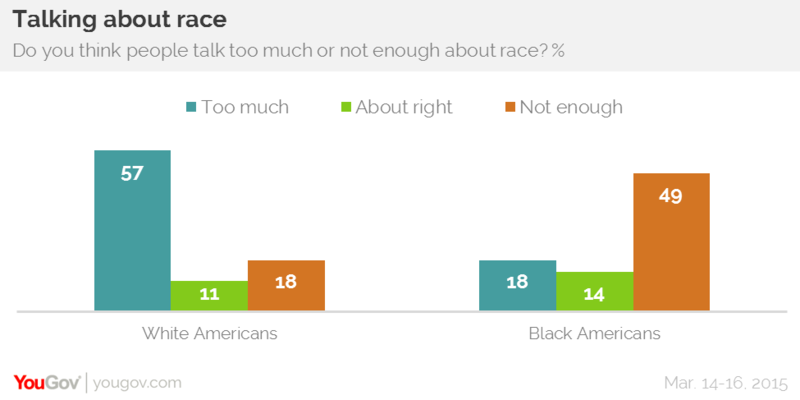 YouGov&apos;s latest research shows that there is a significant divide between black Americans and the rest of the country about whether or not people talk too much about race. Most white people (57%) and half of Hispanics (49%) think that people talk too much about race. Among black Americans, however, only 18% think that people talk too much about race while 49% think we talk too little about it. Only 18% of white Americans think that Americans do not talk enough about race. White Democrats are divided between those who think we talk too much (33%) and too little (32%) about race, but large majorities of white independents (60%) and white Republicans (77%) think we talk too much about race. Overall, most Americans (58%) say that they don&apos;t worry about saying things that sound racist, though 33% of people do sometimes worry that they might say something that could be seen as racist. White Americans (34%) are noticeably more likely than black Americans (19%) to say that they worry about saying something that sounds racist. Among white Americans, though, worries about sounding racist vary significantly. The Whiteness Project is a series of interviews with ordinary white Americans seeking to give them a safe space to talk honestly about race in America without necessarily having to worry about sounding racist, but our research shows that working class white Americans are the most comfortable group of whites when it comes to talking about race. The more educated a white American is, the more likely they are to worry about saying things that sound racist. Among white Americans whose highest level of education is a high school diploma, only 23% worry about sounding racist while 68% don&apos;t worry about it. People with four year degrees are evenly split between the 46% who do worry about sounding racist and the 45% who don&apos;t. Most white Americans with a post-graduate education (52%) sometimes worry about saying something that sounds racist. Most Americans, almost regardless of politics, race or region, say that they both know racists and have family friends who have said racist things. 62% of Americans say that they know a racist, and 69% say that a close friend or relative has said something racist around them. White Americans are the most likely to both know a racist (66%) and to have a close friend or relative say something racist (74%), but even among black Americans those figures are 48% and 50%, respectively. Black Americans report that their racial identity is far more important for them than for any other group. 68% of black Americans say that being black is &apos;very important&apos; to them, compared to 49% of Hispanic Americans and only 17% of white Americans. Most while Americans (53%) say that their racial identity is either &apos;not very&apos; or &apos;not at all&apos; important, something only 13% of black and Hispanic Americans agree with.